Not only are corrugated boxes recyclable, but these boxes are also great mediums for sustainable artists to upcycle into something worthy of an art gallery. The unique properties of cardboard make it a perfect material for constructing highly durable art that can withstand the test of time. 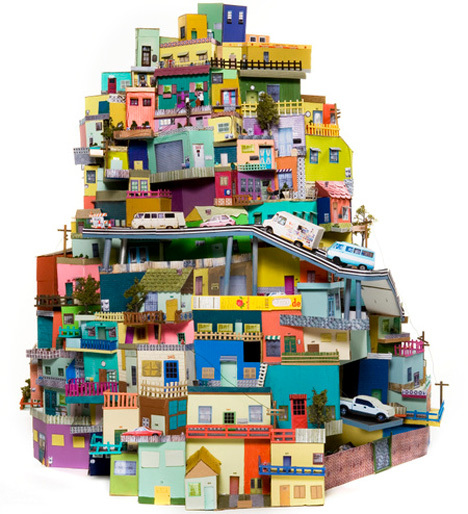 The gallery that follows represents some of the standout artists who create cardboard masterpieces as recycled art. Mark Langan is an Artist who resides in the Cleveland, Ohio suburb of Brunswick Hills. Well versed and adept with numerous artistic mediums, he has concentrated his focus since the year 2004 by working strictly with reclaimed material. Fantastic sculptural works are created using nothing more than mere corrugated boxes, non-toxic glue, a razor knife, a cutting edge and a mat. Mark’s artwork is intriguing because of its composition, but also cries out…reduce, reuse, recycle! Andreas Scheiger lives and works in Vienna, Austria. Drawing and painting, handicraft working and sculpting always has been his passion. He cultivated his technical skills when he worked as a graphic designer and later as an art director in advertising. Inspired by pop art, bauhaus and modernism and the inherent idea of combining graphic design with free art, he passionately experiments with materials and styles. In all his works, he aspires to create a visual impact by simplifying a complex concept. 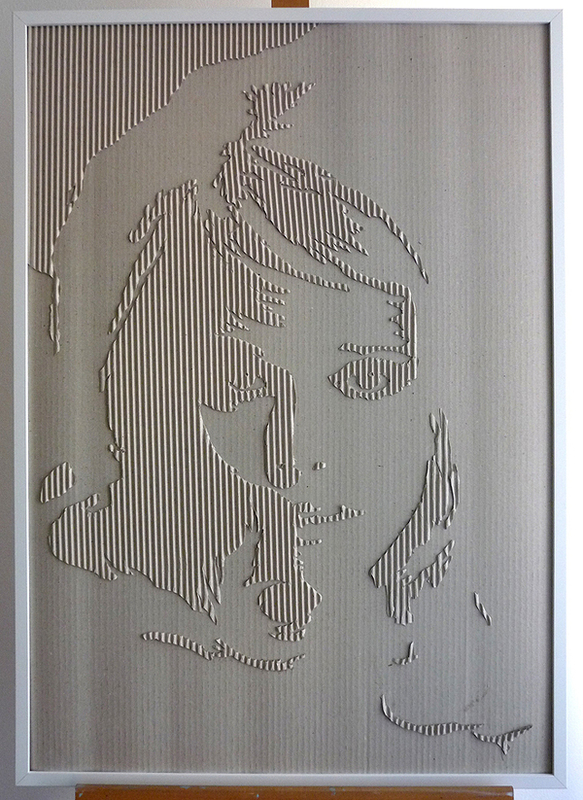 His “corrugated portraits” change their appearance according to lighting, a lenticular effect which is achieved by cut corrugated cardboard only. Thus, the portraits seem to have a life of their own. Want to see more examples of cardboard art? Please visit our Pinterest Board: Corrugated Art | Cardboard Art and follow all of our pins while you’re there! 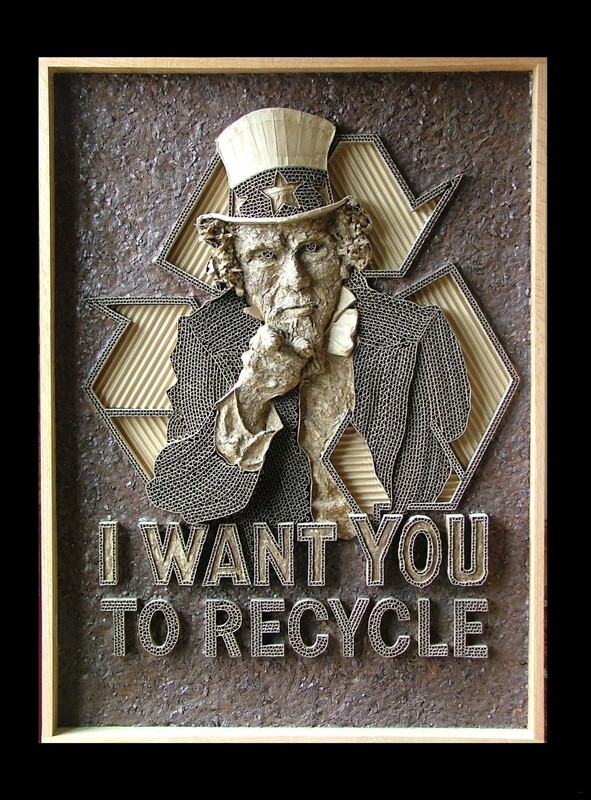 If you’re feeling inspired to create art of your own, visit PrattPlus.com to purchase 100% recycled corrugated boxes.